Simply Three has captivated audiences worldwide with high-octane performances since 2010. 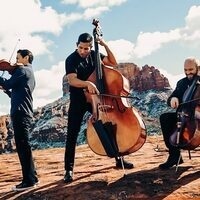 Acclaimed as “having what it takes” (Boston Philharmonic) and “highly imaginative” (Maine Today), Simply Three continues to receive praise for their ability to impress listeners with inventive renditions of favorites from artists and composers ranging from Adele, Gershwin, Coldplay, twenty one pilots, Ed Sheeran, and Michael Jackson. By reshaping convention through genre hopping, the string trio continues to seek the true essence of classical crossover with original works and innovative arrangements that showcase their technical virtuosity and heartfelt musicality.